Amazon doesn't stock this stuff. Putting together parts to build a conventional computer isn’t rocket science. Most parts can be ordered online, and with a little bit of know-how, you’ll end up with a functioning PC in no time. But when it comes to quantum computers, things get vastly more difficult. Collecting parts for quantum computers is so difficult and expensive, according to the MIT Technology Review, that it could slow the development of the technology as a whole — and worse, tech giants like IBM and Google could get a head start while leaving smaller startups and research institutions in the dust. MIT Tech talked to Blake Johnson, the vice president of quantum engineering at a California-based quantum computer startup, who said that specialized parts like refrigerants that keep quantum computers near absolute zero and superconducting cabling are practically impossible to obtain right now. The demand for these specialized parts is outstripping the dwindling supply. And that’s a problem: the quantum computing industry is booming right now. 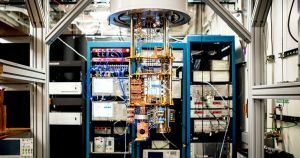 Yet long wait times for these components are significantly slowing down quantum research. To make matters worse, many quantum computing components are made by only one or two companies in the entire world. Cables that conduct very little heat are made by just one manufacturer in Japan. Refrigerant gases — including a special helium isotope called helium-3 — are a nuclear research byproduct, and thereby very difficult to obtain, according to MIT Tech. There are several possible workarounds. Researchers could find other ways to build quantum computers that don’t require extreme cold temperatures to run. Or they could wait until manufacturers catch up with the growing demand for the components needed for today’s quantum computers. Or, of course, economic forces might win out: smaller companies could enter the market and start manufacturing some of the rare components as demand increases.